Overall, I’m thrilled with OS X Lion. (s aapl) However, like any new OS, there are some things that either don’t work quite right or, while working as intended, don’t act the way some may like. So here are five tips and work-arounds I’ve found that might help address some growing pains. 1. Remove icons from Launchpad. Right now, the only icons you can remove from Launchpad are apps installed via the Mac App Store. If you remove the icon, the whole app is removed. In a way, this makes sense: they want to transfer the same ease-of-deletion from iOS to OS X. The problem is, if you have a ton of what Lion sees as apps — in my case, all the old World of Warcraft patches showed up in Launchpad — you’re going to have a mess. I can’t hide the apps completely, so instead I performed the digital equivalent of stuffing them in the closet. I created a single folder, moved any non-app programs into that, and stuck it on the last page in Launchpad. 2. Reveal your Home Library folder. I’m not sure why Apple hid this, but there are two ways you can get to it. The first is to go to the Finder, open the Go menu, and choose “Go to Folder.” Type in ~/Library/ and hit Enter. This will bring you to the folder. If you need to get there more than occasionally, or have an app where the hidden flag is causing problems, you can make it visible by typing in “chflags nohidden ~/Library” in the Terminal. 3. Make an app open in all spaces. 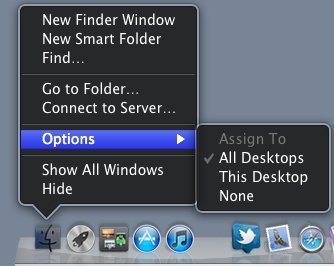 This tip only works if you have multiple Desktop spaces. To add a space in Mission Control move your pointer to the upper-right hand corner and click on the large Plus icon. Then, right-click on the apps’s icon in the Dock, choose Options, and “Assign to: All spaces.” As a bonus tip, you can also create an empty space to quickly flip to an empty display if you need to. 4. Remove icons from the Sidebar. I’ve run into a few instances where dragging an icon off the Sidebar doesn’t actually remove it. If this happens, right-click the wayward icon and choose “Remove from Sidebar.” If, like me, you ended up with some Sidebar folders pointing to now nonexistent folders and can’t remove them at all, renaming the com.apple.sidebarlists.plist file in ~\Library\Preferences folder (it doesn’t matter what you rename it to) and rebooting will restore your Sidebar to default icons. 5. MobileMe Calendar syncing is now set in iCal. This one threw me at first. In Snow Leopard, you set MobileMe Calendar syncing within the MobileMe System Preferences pane. Now, it’s under iCal’s preferences under Accounts. I imagine this is because iCloud will render the MobileMe preferences pane obsolete. These are five quick tips I’ve found to help me ease into Lion. What tips do you folks have? You can with the http://www.mobilesidecar.com bookmarklet. The G+ service currently works when used on the desktop. Although the sidecar is iOS friendly, G+ is somehow missing. Just grab the bookmarklet, come back here and click the bookmarklet. You’ll find the G+ plugin loads after a few seconds and works perfectly. I’m pretty excited about increased security with Lion. What prompted me to get it faster was mistakenly clicking a phishing link from my Twitter wall when I was trying to report the user. I think that was the first time I’d ever clicked something like that. After several redirects and a dialog box, I closed Safari and went straight to the App Store for Lion. Nothing like being ushered to an upgrade! The launchpad is a nice idea in principle – simplify access to all your apps – however an average user is going to amass far too many apps and if anything like me will just want one or two pages of their favourite apps, not an exhaustive list of everything. This app overload needs to be resolved. You can reveal the Home Library folder in the Finder GO menu by pressing the “option” key while the GO menu is displayed.